After having performed the workshop preliminary acceptance in Kreuztal where GEORG had perfectly fulfilled all specifications instantly, the line is now on the way to the customer. With this new line the customer will be able to produce „laser-competent“ material of extremely low stress which will not distort in the laser welding process of different components. Initially, GEORG has designed the levelling center for the levelling of large-size aluminium plates but steel plates can be processed as well. In order to meet the very high demands of aircraft manufacturers regarding the flatness of plates between 1 and 10 mm thickness, GEORG has provided the leveller with two levelling roll cassettes including rolls of different diameters. So the customer may use the suitable set of rolls for each plate thickness. With the automatic cassette change car the cassettes can be exchanged in less than 15 minutes. 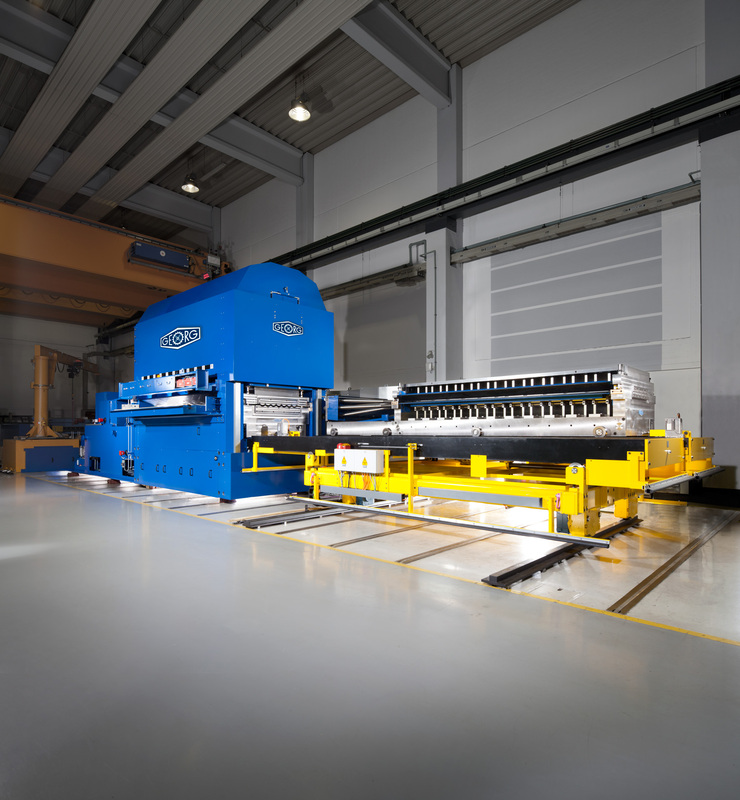 The machine is equipped with eleven rows of back-up rolls for the precise levelling of plates with edge waves – frequently occurring with annealed aluminium plates – over their entire width. In the infeed area, the levelling rolls have a larger distance in order to facilitate the infeeding of wavy plates. Furthermore the infeed roller table is equipped with centering units to allow different angular positions of plates. At the leveller exit a laser measuring beam for flatness measurement with eleven stationary triangulation lasers has been installed. The results provide the operator at the control desk a perfect overview during the running process. Thus, he can decide immediately and safely whether the levelling result fulfills the tight flatness requirements or whether another leveling process has to be performed. For the fast transport of plates back to the infeed roller table the machine is equipped with a reversing drive and a fast lifting function of the upper levelling roll set. For checking and documentation of parameters such as flatness, thickness, length, width and diagonal of the finished plates the line is provided with a stone-type measuring table of highest precision, installed next to the runout roller table. This measuring table enables a one-hundred percent check of plates. For this measurement a measuring beam with triangulation sensors and cameras moves above the plate and detects the geometrical data with an accuracy of a hundredth of a millimeter.